My pace was off. I had done 8 fourteeners in June and none in July. 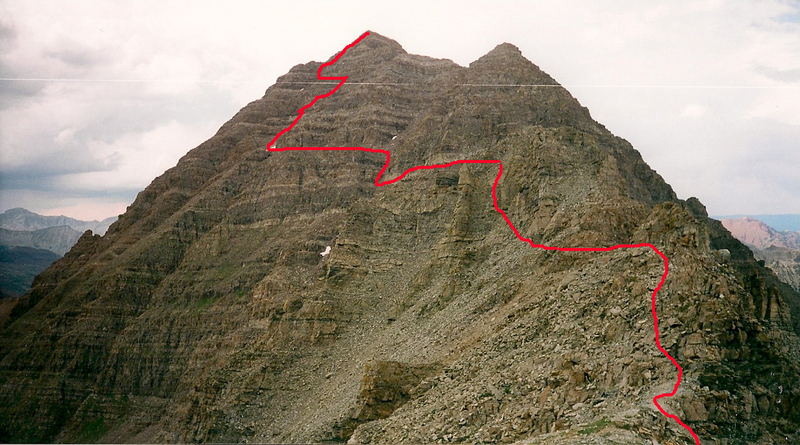 Determined to reverse the trend, I set out to climb South Maroon Bell and Castle on July 19-20, 2002. 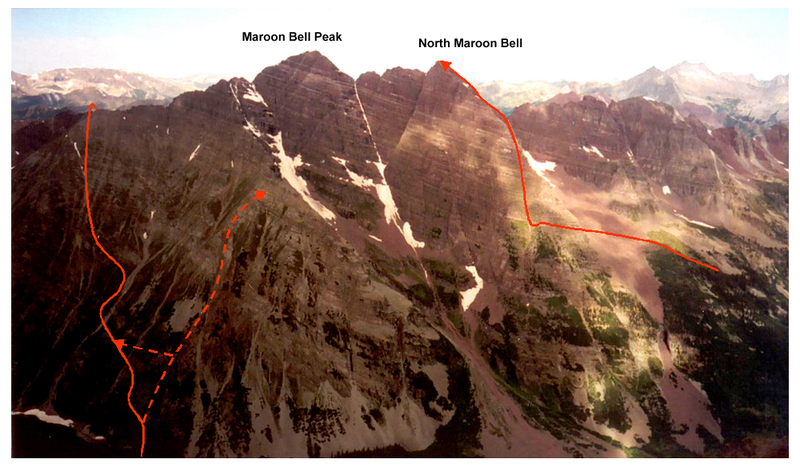 My original plan was to climb Castle (and Conundrum) as a warm up before climbing my real goal, South Maroon Bell (SMB). However, the weather forecast was looking questionable, so I decided to go for SMB first to give myself a second day to complete the SMB climb if storms chased me off on the first attempt. 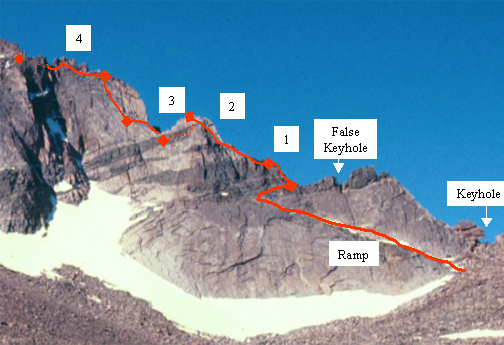 I briefly considered doing the traverse between the two Bells and bagging both summits. However, I felt wary of the steep, exposed, loose conditions I had heard and read would be encountered, so I settled on an attempt on SMB alone. Hell, it would be a full day’s work at approximately 10 miles and 4600 feet of elevation gain, according to the guidebook. Since this would be a solo effort, I prepared better than I normally do. I studied two guidebooks (Dawson & Roach) and tried to reconcil the information into a single, consistent set of directions. I copied the topo from Dawson since it was more detailed, transcribed a single set of route directions, and even brought a picture of the southern exposure of SMB with Roach’s route roughly sketched out. I did everything I could think to prepare for day long day of route-finding. It wasn’t enough. I started early, leaving the Maroon Lake trailhead at 5:15am in complete darkness, and headed toward Crater Lake. On the way out, I met a fellow who was going to climb both peaks – he said it wouldn’t be too difficult. With a weakened resolve to do only SMB, I started hiking with a fast pace. I suppose I had a little extra adrenaline as a result of climbing without a partner. Hell, even my boots felt good at first. My water planning was also coming off well. I had had several water shortage mishaps in recent weeks and was determined to drink enough water without carrying too much at any one time. I brought 3 liter bottles: one full and two empty. I drank one liter on the hike in and was able to fill all 3 bottles at the creek just before heading up toward the South Ridge. This was the last of my overwhelmingly good performances. At approximately 7am, I reached the climbers trail for the South Ridge of SMB. It was about twenty yard before the spot where the trail crossed the West Maroon Creek for the first time (there was an earlier crossing of a tributary about 0.5 mile before), and was marked by two cairns. Since I couldn’t see the Bells from my position, I tried to figure out where I was and where I was going before heading up. It was very confusing. 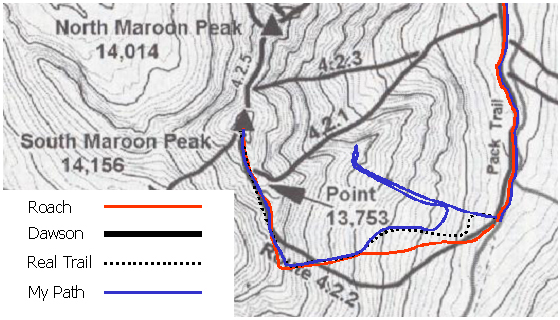 Overhead was a steep ridge, while to the left was a broad slope with small gullies, and further to the left was another ridge. I could see what might be the South Ridge at the very top of the visible mountain, but I could not be sure where the SMB summit was located. More importantly, I could not make out the “SE ridge dropping from the South Ridge” which I was supposed to aim for, at least according to Dawson. On the other hand, Roach just said to “climb west for 1.0 mile to reach the South Ridge.” At that point I sure was sorry I wasn’t better prepared. The topo map I had taken from the Dawson guidebook (scale: 1:50,000) displayed a route line that went left and then right up a broad slope between two ridges. Perhaps it meant between the ridge above me and the ridge I could see to the left. Roach’s description to “climb west for 1.0 mile to reach South Ridge” seemed to confirm this idea. So, my best guess was to go to the left a bit and then straight up (west) between the major ridges. While I did not know exactly what I needed to do, I had no way to gather more information. I was happy to have a trail to follow that headed in the direction I wanted. Then the damned trail took hard left and continued due south for an indeterminate distance at the 10,700′ level. I couldn’t believe that was the way to go. The key was the “SE Ridge coming down from the South ridge.” Dawson’s directions said to go to the south side of the SE ridge, and I couldn’t believe that I was supposed to go to the far side of the ridge to my far left; it just didn’t jive with Roach’s “climb west for 1.0 mile to reach South Ridge”. And I was in a hurry to beat the weather, so I didn’t have much time to think. In my rush to make progress, I decided that the ridge that had been above me at the start of the climbers trail and was now to my right, had to be the SE Ridge (even though it aimed in a northeasterly direction). This allowed me to follow Dawson’s directions to climb along the south side of the SE Ridge and follow Roach’s “climb west for 1.0 mile….”. Too bad it was wrong. So I left the trail and continued westward. I climbed a 2nd class rocky gully and came though a thicket of willows to a lower angle slope where I studied my positions once again. The route continued to check out. I figured that SMB was to my right, but out of sight, and that by climbing the gully to the south of the ridge that was now to my right, I would reach the South Ridge of SMB . 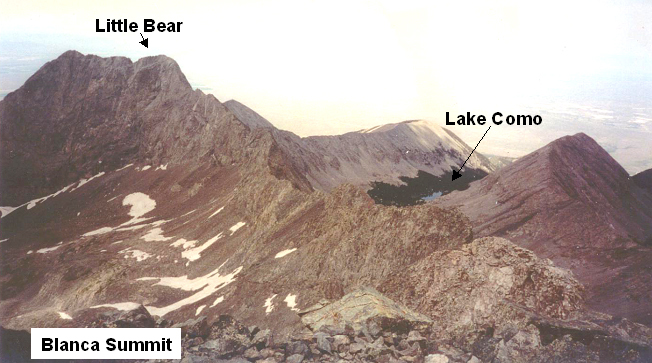 About 2 hours later, at 9:30am, I mounted the crest of the ridge at 12,500 ft that I figured was the Southeast Ridge of SMB and found myself looking across a gulf to North Maroon Bell. My eyes followed the ridgeline between the Bells to find SMB summit. My line to SMB summit was blocked by many nasty-looking towers. It wasn’t impossible, but very improbable that I would find a survivable path. Crap. I decided it wasn’t worth the risk, and I had that infrequent, but terrible sinking feeling that I didn’t have time to finish. My original plan was to summit at noon, now I would be lucky to summit by 3pm on a day with a bad weather forecast. I wondered if I should just call it a day. But at least I knew where I was, and all I had to do was figure out how to get from where I was to the summit, and quickly. I finally had to admit that the original trail that I discarded at the 10,700 ft level was the right trail. But I didn’t think I could go back down 2,000 feet, traverse south to the next ridge (the SE Ridge! 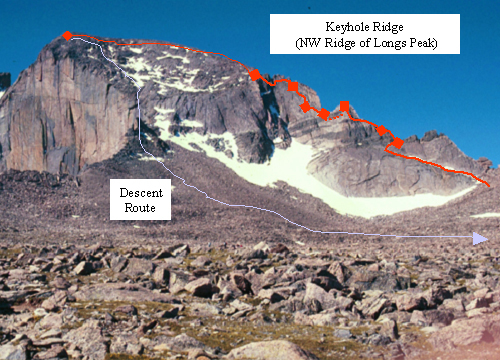 ), and climb 3,200 feet in loose rock and “obscure route” finding in time to beat the weather. So my next task was to find a way to get to the SE Ridge, to the south of me, without losing too much altitude. I descended the steep gully to the 12,000 ft level where I crossed to the crest of a smaller ridge a short way to the south of my current position. I hoped I could traverse south at this level to reach the proper route, but there were many small ridges and probable steep drop-offs along the way. And I was still determined to not try to force anything and get myself killed, so I backed off. But I did managed to spot a trail far below of some quality that led over to the ridge further south which I decided would be my target. So, I backtracked the route I had come up earlier in the day down to the 11,000 ft level and found a faint traverse that worked. I managed to save 300 feet. 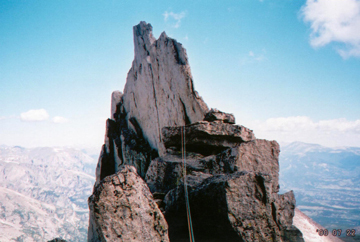 As the traverse ended and the climb began, my body began to reject the entire notion of mountain climbing. I felt sick to my stomach and my feet were suffering a preordained tragedy in the Greek tradition. The various paths; developed during analysis of "what went wrong"
Ever since buying a pair of La Sportiva Eigers to replace my aged Makalus, I have suffered terribly. The boots will not break-in, attempting to force my feet to do so instead, and the excessive rubber in the boot design causes my feet to sweat profusely and skin to chaff like soft cheese. I performed a bit of foot repair with moleskin and athletic tape, changed my socks for the third time in the day, and made the decided that I would relegate my new boots to winter and spring climbing. Fortunately, I had learned my lesson and realized that I didn’t really have any reason to think I knew a better way to go. I resigned myself to simply follow the cairns and hope they led me to the summit. A view toward Crater Lake from Maroon Bell. The end of my earlier route finding error is visible. The South Ridge trail quickly became flat and easy until reaching the slopes of Point 13,753. At this point, the route seemed to disappear. Instead of continuing in a traverse, the route seemed to ascend Point 13,753, against the commands of the guidebook know-it-alls. Still humbled, I simply followed the cairns, linking them together in the most reasonable path. With a sharp eye for cairns, the route finding went easily. I was careful to examine and weigh alternatives at each juncture and make no mistakes. The trail was exposed and terribly loose in several places, but it worked. It felt like climbing over a pile of land mines; a misstep would be fatal. Along this path, I met up with the fellow from the Trailhead who was going to do the traverse. When asked how it went, he indicated that he shouldn’t have attempted it and wouldn’t do it again without a rope. He seemed a fellow not humbled easily; I was at once glad of my decision to be conservative. 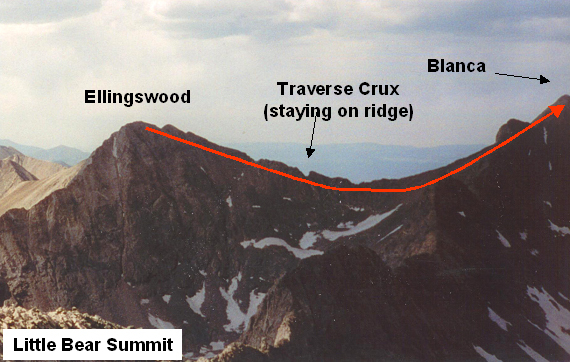 I scrambled up the SW Couloir and up the South Face and further left along the ridgeline to the summit. I sat down at 2:15pm and drank my last ½ liter of water. As I rested on the tiny summit among the rocks and swarming flies, I studied the weather. The clouds had been increasing during the last couple of hours with the wind appearing to be moving west. From the summit, I could see a massive rain to the North (turned out to be a violent and newsworthy thunderstorm in Glenwood and Basalt), but I couldn’t determine the storm’s path. The sound of thunder sufficiently settled the question and got me up and moving. I had to descend a long way over slow terrain to get to tree line; I hoped I’d be lucky with the weather. But I was in trouble regarding my own water. 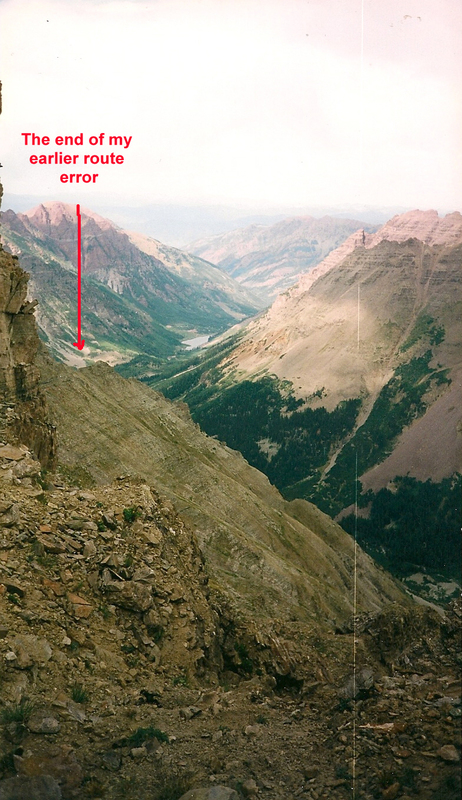 I was already dehydrated and had nearly 4,000 feet to descend to the West Maroon Creek. Despite my need to escape, I scrambled over to a melting snow patch in the SW Couloir to see if I could scrounge some water. It was dripping, but slowly. I only waited long enough to fill two liters with cloudy water. And I needed water right away, so I put them both in my pants pockets to warm them and continually shake them to dissolve the iodine tablets. I must have been a sight to see. 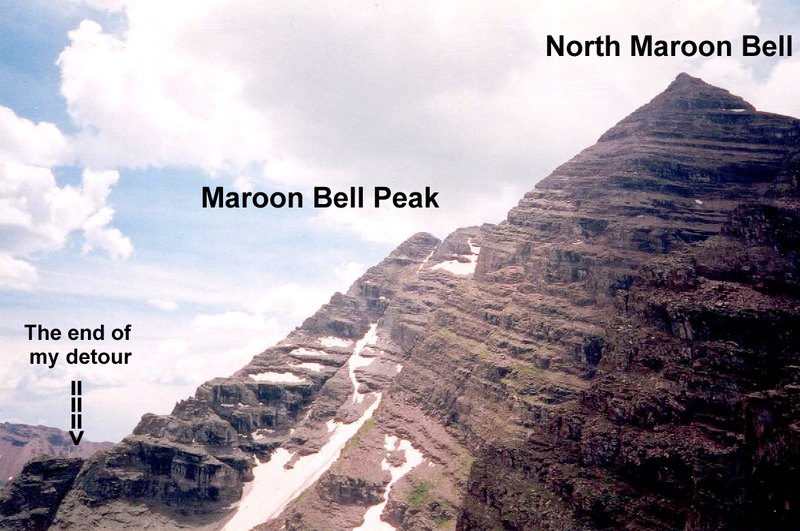 My view from the summit of Maroon Bell Peak. The stormy weather to the north is clearly visible. The descent to the creek was endless. Down SMB, down and across Point 13,753, down the South Ridge, down the SE Ridge, over and down the grassy slope . . . it went on and on and on. I was so tired that I took to sitting in the dirt every 20 minutes or so. I finally reached the creek (10,400 ft) at 6pm, nearly 3.5 hours after leaving the summit. I immediately went to the creek and refilled two liters while finishing the last of the melted snow I carried down from 13,500ft. The weather had held out for me again. On the hike out, I started cramping. A foreshadowing of the difficult night I would have due to electrolyte loss. I reached the car at 7:15pm and immediately drank a liter I had stashed there. I drank nine liters of water during the day, including 1 at the car at each end of the trip. It wasn’t enough; I urinated only once on the hike and not again until after midnight at home. I had hiked approximately 12 miles and climbed 6,100 feet in 14.5 hours. I was extremely pleased that I was able to overcome my route finding mishap and finish the South Maroon Bell; but I knew I had to figure out a better way to prepare better for my adventures. And Castle would have to wait until the next trip. (2) Made bad decisions along the way due to flaws & biases in my thinking. Optimism Bias: I was foolishly optimistic about being able to finish before the weather turned dangerous; I figured I could just retreat if the lightning came, but it took 3.5 hours to descend to the trees from the summit.